Yes finally racing season has begun. I have made it through the dark tunnel of the off season. Although this winter’s tunnel normally, made dark by countless hours spent hooked up to the torture device we all call trainers, was surprisingly pleasant. Punctuated by bouts of good weather and some good trips down to the southern warm climates like Arizona, Greenville, and most recently Gattlinburg, TN, the winter went by faster than a Swiss TT champ with a motor in his bike. I had the chance to go down to Gattlinburg a few weekends ago, some friends (not cyclists, oh the spandex jokes were a-flying) were heading down to the mountains to do whatever people who don’t ride bikes do in the mountains…(I still haven’t figured it out). Due to a blown tire I only got one serious ride out of the trip, but it was definitely worth it. I tried to hook up with a certain New-Vacuum-cleaner team who were also in Gatlinburg, but they were probably too intimidated by my exceptional power to weight ratio to ride with me. It was a great one ride, crossed the Appalachian Trail…twice. And met up with some Michigan guys riding down there on vacation and rode a good part of the climb on the way back with them. After a good rest week it was onto actual racing. 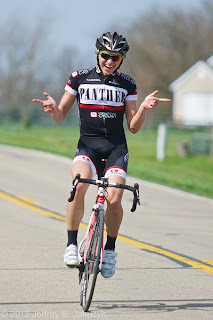 I drove down to Louisville Saturday for a short hour long crit. It was a rest week and if I had stayed home I’d just end up drinking with my roommates (St. Patrick’s Day and all). Anyway I botched the tactics a bit in the race. I missed a move containing the Elite national TT champ and a handful of Texas Roadhouse riders (of which there were 20 in the race). I attacked a bunch to try and catch back on but I was getting no love from the field with every other team in the break, good thing it was a training race. After driving back to Cincinnati Saturday a friend cooked some traditional Irish food, which when coupled with beer is an excelent pre-race food, because Sunday went much better. The power of teammates was also pretty heavily highlighted Sunday as well. 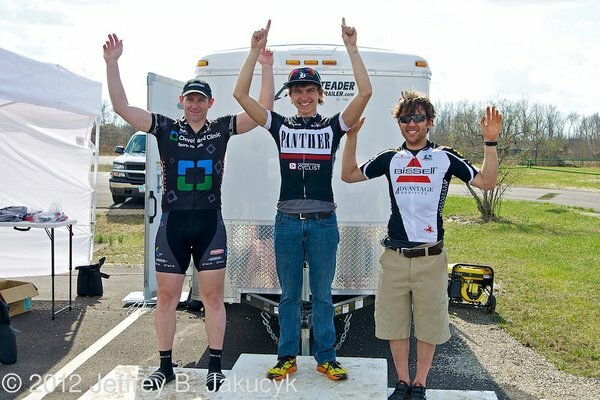 It was the first in the Ohio Spring Series up near Columbus. The very boring course was made slightly more lively with a pretty stiff wind and freak downpour that lasted 10 minutes. Gabe and Andy Clarke were both at the race as well, and it highlighted pretty well how much easier it is to race when you have teammates. Out of 7 laps Andy spent the first couple off the front, at one point countering his own breakaway just as they were about to get caught to spend another lap off the front. When his group was finally brought back I went on the attack with Andrew Otte from Nuvo. Unfortunately no RGF guys came with us, this doomed our move as they were the other dominant team in the race. After half a lap we were chased down by RGF. Gabe took his turn attacking at got away in a group, but our numbers in the group did not look good, so Andy went back to the front and set tempo for a lap. Once we got through a headwind section I opened up the attacking again, a few counter attacks later we had caught the breakaway group and we were all pretty gassed going into the last lap. I attacked on the finishing climb through the bell lap bringing with me one RGF guy. With just the two of us we had a good combo. Gabe and Andy set a good tempo and our advantage over the field swelled to winning margins. Jeff from RGF had been in breakaways nearly the entire day and was getting pretty fatigued. With about 5 miles left in the race he was reaching the end of his rope and quit pulling. I was able to gap him and solo for the win. For having only 3 riders we executed team tactics nearly perfectly. Plus anyone who knows me knows that I hate riding hard by myself. Therefore there were surely team tactics at work forcing me to ride….nothing other than….a TIME TRIAL. Another cool aspect is Strava is doing a competition for fastest laps for all the OSRS races. This is great because it combines my love of racing and totally unhealthy addiction to Strava.